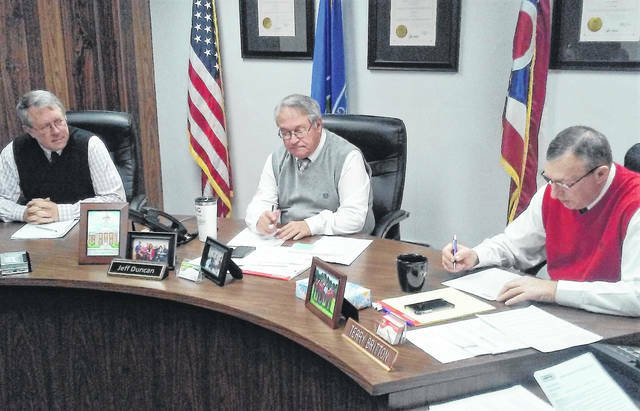 From left, Highland County commissioners Gary Abernathy, Jeff Duncan and Terry Britton are shown during a commissioners meeting Wednesday. At stake was $844,000 from the DOJ’s Byrne Criminal Justice Innovation Program, now known as the Community Based Crime Reduction Program, that was earmarked for crime fighting and prevention, residential property blight removal and economic development in the Rocky Fork Lake region. Commissioners voted unanimously at their weekly meeting Wednesday to end efforts at salvaging the grant, placing the blame on an inflexible federal bureaucracy and government red tape. Two years ago, according to a news release, the DOJ’s Bureau of Justice Assistance announced the awarding of $843,498 for the two-year Rocky Fork Lake Area Safety and Advancement project, with an implementation period of September 2016 to September 2018. However, the BJA almost immediately began to identify problems with the project proposal, primarily questioning the creation of a land bank, and the fact that the project leader/fiscal agent, Turning Point Applied Learning Center, was not an employee of the county. Another concern from the DOJ was whether sufficient staffing was in place to administer and oversee the grant. When these objections surfaced, the county commissioners immediately froze the expenditure of any further grant dollars out of concern that they may have to be returned to the DOJ. “Frankly, the minute they said Turning Point couldn’t be in this is when this whole thing began to go south in a big way,” Abernathy said. Abernathy said that the guidelines of the grant prohibit the funding of existing deputies, since the grant specifies that money be allotted for new hires only. However, under the current Fraternal Order of Police contract with the sheriff’s office, he said, deputies have the right to bid on shifts, with no guarantee that a deputy at the lake would be a newly hired deputy. He said commissioners approached the FOP about getting a waiver of the contract concerning that provision, which it declined. After a 12-month extension for the grant was awarded in September, commissioners requested a two-year extension, saying they could not address all the needs of the lake area in just one year. Despite the difficulties the commissioners encountered in the Rocky Fork Lake grant, Abernathy said commissioners gained a lot of information from local organizations and individuals. Duncan said there are many “positives that came out of a negative situation,” pointing out that the Ohio Department of Natural Resources has made improvements at the lake, there is now an increased presence of law enforcement, and the health department has done some cleanup work. “And though it was one thing the Department of Justice had a problem with, we’ve created a land bank that is ready to go, too,” he added. Prior to entering executive session, commissioners reiterated their plans to employ Delinquent Tax and Assessment Collection funds to support the land bank. As previously reported, commissioners were considering a vote to allocate up to 5 percent of the biannual DETAC funds to the land bank for unrestricted use at cleaning up blighted properties, not only in the lake region but throughout Highland County. With commissioners deciding to terminate the Rocky Fork grant, Britton said some of the money used in its initial stages may have to be reimbursed to the DOJ and there will be a protracted “close-out procedure” to formally withdraw Highland County from the grant. He also complimented the Rocky Fork Lake Community Alliance for its assistance and guidance on the aborted grant, and reaffirmed the commissioners’ commitment to the safety and growth of the region. Also during the meeting, commissioners met with Barrera during executive session, with the sheriff assuring commissioners that in the wake of the grant’s demise, he will see to it that a deputy will be stationed at Rocky Fork Lake as often as possible. Barrerra was on hand primarily to speak with commissioners regarding installing new body scanners in the jail. Mike Colvin of Aramark Food, Facility and Uniform Services submitted proposals for varying contract lengths to commissioners, with the intention of “enhancing protection of both Aramark and county employees” against smuggled contraband in the jail. Steve Witham of the Highland County Board of Elections briefed commissioners on needed equipment upgrades, submitting proposals for three different voting machine systems. Witham said that though Ohio requires the upgrades be in place before the 2020 general election, he would like to see Highland County’s in place before next year’s primary election to verify the system chosen is functioning properly. Commissioners also met with John Hemmings of the Ohio Valley Regional Development Commission for an update on personnel in the organization and to report on progress made in the Appalachian region, including a pair of proposed solar projects proposed for the southern part of the county. In other matters, commissioners approved 10 line item spending transfers within the county budget and signed off on a pair of contracts. One of the contracts authorized a right-of-way change for Pike Natural Gas Company, extending an easement along the property line of the Highland County Fairground. Following a moment of silence in honor of the late former president George H.W. Bush, commissioners honored the services of two Highland County icons. Calling her the “go-to person if you want to know Highland County history,” Duncan saluted Jean Wallis for her work with the Highland County Historical Society. A reception will be held for her at 2 p.m. Sunday, Dec. 9 at the Highland House Museum. He also commended longtime local broadcaster Williard Parr for his more than six-decades of keeping the area informed and entertained on WSRW radio. A public reception will be held for Parr at Southside Praise & Worship Center, 621 S. East St., in Hillsboro on Thursday, Dec. 6. from 5-7 p.m.